Terry Manning is a music producer, songwriter, photographer and recording engineer known for work in rock, rhythm and blues, and pop music genres. Manning began in the music industry in the early sixties in El Paso, Texas, where he played guitar with several local bands, and on occasion accompanied his friend Bobby Fuller. He moved in 1963 to Memphis, Tennessee, where he worked for years at both Stax Records and Ardent Studios as an engineer and producer, recording and mixing such artists as Isaac Hayes, Ike & Tina Turner, Booker T. & The MG's, Eddie Floyd, Al Green, Rufus Thomas, Sam & Dave, Billy Eckstine, Otis Redding, The Boxtops, Percy Sledge, The Staple Singers, Johnnie Taylor, Leon Russell, Ronnie Milsap, and many others. Manning was a principal part of Stax owner Al Bell's production team for The Staple Singers, responsible for such hit records as "Heavy Makes You Happy," "Respect Yourself," and "I'll Take You There." In 1970, Manning licensed release of his own solo album, Home Sweet Home, on Stax's Enterprise label. Later working as an independent, Manning produced or engineered recordings by Joe Cocker, Wattstax, Alex Chilton, Big Star, James Taylor, Leon Russell, Led Zeppelin, ZZ Top, Jason & the Scorchers, Rhino Bucket, George Thorogood and The Destroyers, Joe Walsh, Johnny Winter, The Fabulous Thunderbirds, Molly Hatchet, The Angels, Johnny Diesel and The Injectors, Lenny Kravitz, Jimmy Buffett, Shakira, Crash Test Dummies, Shania Twain, Bryan Adams, Widespread Panic, and many others. As a photographer, Manning photographed Chuck Berry, Procol Harum, Steppenwolf, Janis Joplin, Jimi Hendrix, Dusty Springfield, and many other musical artists of the period, as both an independent and as a writer/photographer for New Musical Express. He was also one of the last to photograph his acquaintance, Dr. Martin Luther King, on the day before the assassination. In the mid 1980's Manning moved to London, and worked for a year out of Abbey Road Studios. 1991 saw him founding Lucas Engineering (named after his new son), a boutique audio company which made professional audio recording gear for himself and others. This company expanded in 2008, adding microphones to their arsenal of products. Lucas Microphones have since become amongst the top high end recording devices in the audio world. Foundational text courtesy of Wikipedia. Photos courtesy of Chris Juried. 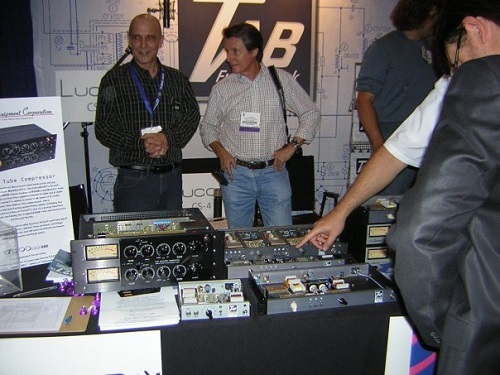 - Terry Manning, with Larry Janus, at the 2011 AES Convention discussing the Lucas "Moonray" microphone preamplifier, prototype. Photography courtesy of Chris Juried. 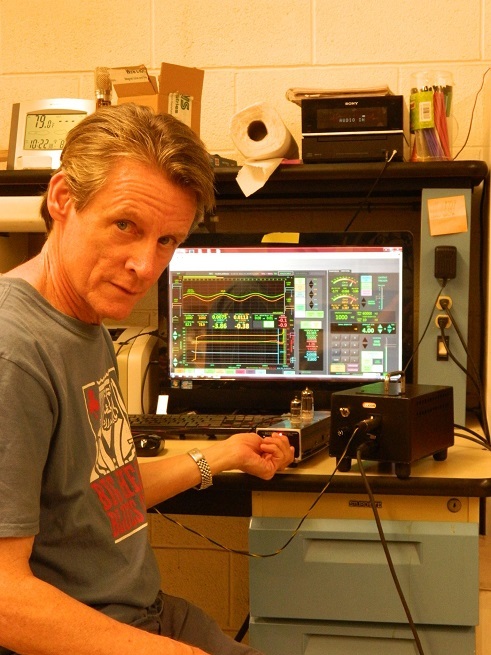 - Terry Manning at Oliver Archut's, tab-funkenwerk headquarters, checking out the Lucas "Moonray" microphone preamplifier, prototype, using custom Tube Equipment Corporation test equipment. Photography courtesy of Oliver Archut. - Terry Manning, with Larry Janus, at the 2009 AES Convention. Photography courtesy of Chris Juried. - Terry Manning, with Mike Harris, at the 2011 AES Convention. Photography courtesy of Chris Juried. - Mike Harris, EveAnna Dauray Manley, Larry Janus and Terry Manning at the 2011 AES Convention. Photography courtesy of Chris Juried. Do you have content or pictures, to add, of Terry Manning? Do you just want to say "Hello!"? Please feel free to Share it, here!